Wales-Smith D (1888-1966). watercolour signed Douglas W Smith and dated 1918. Immediately after the surrender of Turkey in November 1918, Vice-Admiral The Hon Sir Somerset Gough-Calthorpe GCMG KCB CVO, Commander-in-Chief Mediterranean with his flag in HMS SUPERB (Captain S H Radcliffe CMG RN) and with HMS TEMERAIRE (Captain E V Underhill CB RN) in company, proceeded through the Dardanelles (of painful memory) to Constantinople and took up his appointment as British High Commissioner for the surrender talks. The two British warships, accompanied by others including HMS LORD NELSON, CAESAR and the French DIDEROT, initially lay alongside the jetty before moving out to anchor, as Wales-Smith has painted here. They are lying off the Golden Horn; the Genoese Tower lies behind the destroyer in the background on the right. 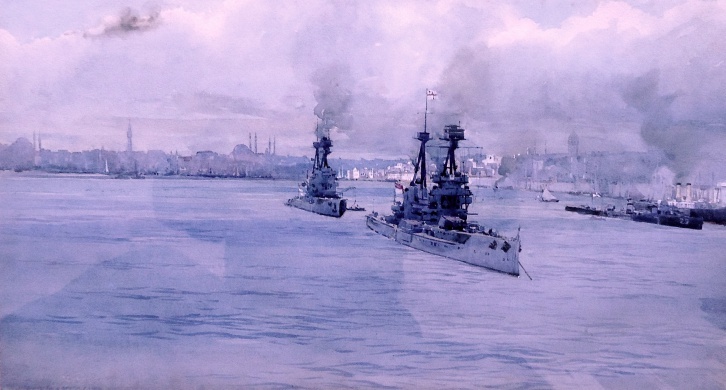 This turbulent period in Turkey’s history has been much painted, the Imperial War Museum holding several similar scenes by Frank Mason and Philip Connard. In Britannia Royal Naval College Dartmouth’s wardroom hangs another, “HMS SUPERB leading the British Fleet to Constantinople November 1918”, also by Frank Mason. Douglas Wales-Smith’s watercolour here of SUPERB and TEMERAIRE seems to have avoided being so acquired! SUPERB, a dreadnought of the Bellerophon Class and mounting ten 12 inch guns, was first commissioned in May 1909. She was hard worked throughout the war and ended her days in the scrapyard in 1922. TEMERAIRE was a sister ship, also commissioned in 1909 and was paid off for scrap even earlier than SUPERB, leaving for the breakers in 1921. Both ships were undoubtedly worn out and verging on obsolescent by the end of the war but post-war manning difficulties and the terms of the Washington Treaty hastened their demise. Initially called Douglas Smith the artist added Wales (one of his Christian names) after WW2 to avoid confusion with other artists named Smith, and so his early artwork – as here – is signed Douglas W Smith. He specialised in painting naval scenes of both wars and was a portrait artist of note too: the National Maritime Museum, Greenwich holds 10 such portraits of senior naval officers as well as scenes of the Battle of Jutland painted by him. Another of his watercolours, a charmingly painted scene of winter on the hills around Scapa Flow during the days of WW1 when it was host to the Grand Fleet, recently appeared at auction near London.